On the way to an event on another listing site, I finally stopped at the NC transportation museum, with the intent of riding the train and having a look around at the displays, before heading on to the event in the afternoon. I don't know how many times we'd zoomed by on I-85 without stopping here before. It was also Pirate day at the museum, so the place was full of people dressed in pirate costumes, which was even more entertaining - Pirates riding trains! Unfortunately, the person before me in the ticket line got the last ticket for the morning train ride. So I walked down along the waiting train to the caboose, and noticed plenty of empty space on a couple cars. Just as I was working up the nerve to jump on the train like a hobo, along came the brakeman. I mentioned my intent, and he said he'd find out if I could ride on one of the empty cars, which weren't being heated. So, short story long, the conductor said I could ride on the engine with the engineer! After the train ride around the site, I toured the displays. Nearly my last stop was in the "Flue Shop," which was built in 1924. In this shop workers took old tubes and flues from steam engines and rebuilt them. After diesel engines replaced steam engines, this shop became an electricians shop. Now it displays many antique cars, motorcycles, and small trucks. To my pleasant surprise, two of the vehicles were Corvairs, including a 1961 Rampside truck/van, and a bright red, 1964 Monza Convertible. Rail yards have been catching my eye lately, not sure why. That's one reason I decided to stop at the NC Transportation museum, which is located at the old Spencer Shops and rail yard. Train travel, in some ways is a bit of an anachronism being mostly superceded by highway and airline travel. Nevertheless, there is a group of people, known as railfans or similar names, "who enjoy recreational capacity in rail transport." Perhaps my goal in hiding these virtuals is to add geocaching to the list of interests often combined by railfans, because "railfans often combine their interest with other hobbies, especially photography and videography, radio scanning, model railroading, studying railroad history and participating in railway station and rolling stock preservation efforts." After all, geocachers with their self-imposed separation from "muggles," are not unlike railfans, who fit the term "Anorak, a British slang which refers to a person who has a very strong interest, perhaps obsessive, in niche subjects. This interest may be unacknowledged or not understood by the general public." Another definition, trainspotter, is "a person who collects train or locomotive numbers as a hobby." Or, "A person who obsessively studies the minutiae of any minority interest or specialized hobby." Also, to be fair, railroads remain the dominant method of transporting heavy goods or minerals over land, and have played important roles in history, both in peacetime and wartime. So, as I look at maps and geocache locations, interesting (to me) features of railroads catch my eye, and rail yards are one of these, because they are big and stand out. But, you may ask, "why the NC Transportation Museum, what's the interest there?" "A rail yard, railway yard or railroad yard is a complex series of railroad tracks for storing, sorting, or loading and unloading, railroad cars and locomotives. Railroad yards have many tracks in parallel for keeping rolling stock stored off the mainline, so that they do not obstruct the flow of traffic." The NC Transportation Museum in Spencer is interesting for several reasons. Not least, for me, is Amtrak trains pass by, on the route to/from Washington, DC, and thus I've ridden past the museum, previously unaware of its existence or significance. We've also zoomed by on I-85, which also passes near. More interesting, historically, is the connection with the the older Spencer Yard and Shops in Spencer. The "historic Spencer Shops, once Southern Railroad's largest steam locomotive repair facility on the east coast," is now the site of the North Carolina Transportation Museum. 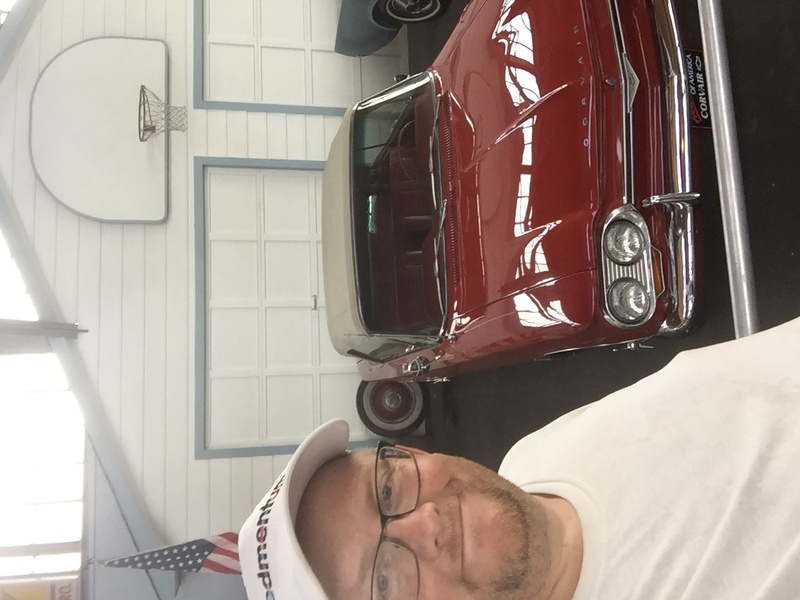 To log this virtual, upload a picture of yourself with the red, 1964 Corvair Monza Convertible in the background. Use the shorter, 6-letter word on the tires as the logging password. Nve pbbyrq, ubevmbagny bccbfrq, 6 plyvaqre! This is a great place to hange out and check out old cars, planes and trains. Take the time to check it out. Thanks for the cache.